"We believed that today was the day to solemnly declare a Catalan republic, and we probably missed an opportunity." 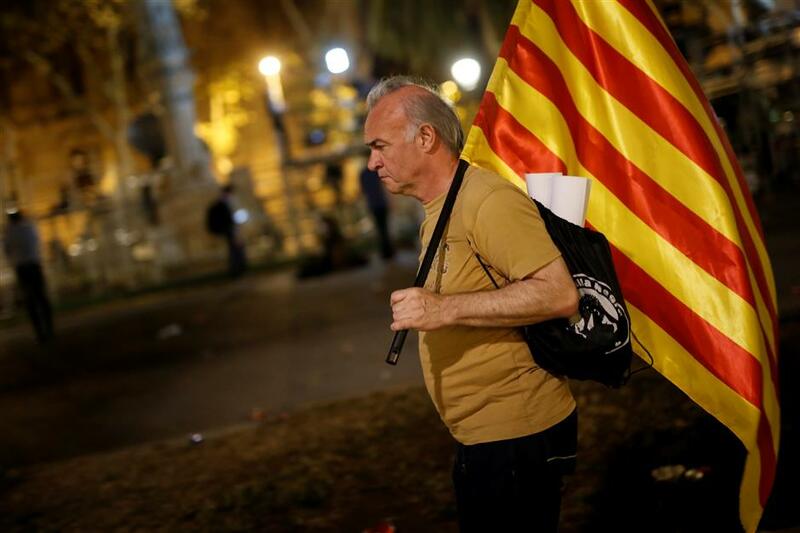 A man walks with the Catalan flag in Barcelona on October 10, 2017. Catalan leaders signed a declaration of independence from Spain on Tuesday but immediately put it on hold and called for talks with Madrid on the country's worst political crisis in decades. As Spain headed into the unknown, Prime Minister Mariano Rajoy was to chair an emergency cabinet meeting early Wednesday to discuss the central government's response. In a speech to regional lawmakers in Barcelona that drew both praise and criticism from separatists, Catalan president Carles Puigdemont said he had accepted "the mandate of the people for Catalonia to become an independent republic" following a banned referendum on October 1. But the 54-year-old asked the Catalan parliament to "suspend the effects of the independence declaration to initiate dialogue in the coming weeks". He has called the cabinet meeting for 0700 GMT Wednesday. Deputy prime minister Soraya Saenza de Santamaria told reporters shortly after the signing that Puigdemont was "a person who doesn't know where he is, where he's going or with whom he wants to go". EU nations are watching developments closely amid concern that any Catalan move to break away from Madrid could put further pressure on the bloc still dealing with the fallout from Britain's shock decision to leave. Merce Hernandez, a 35-year-old architect, said: "I am very emotional, this is a historic day. I'm satisfied." But in Barcelona's trendy Gracia neighbourhood, resident Maria Rosa Bertran said she was against a delayed secession. "I find it even worse because it is suffering a longer agony, indecision and uncertainty is the worst thing that can happen to us," she told AFP. Police deployed en masse around the regional parliament ahead of Puigdemont's address, blocking public access to a park that houses the building as crowds watched the session on giant screens, waving Catalan flags and some brandishing signs reading "democracy." At stake is the future of a region of 7.5 million people deeply divided over independence, one of Spain's economic powerhouses whose drive to break away has raised concern for stability in the European Union. EU President Donald Tusk had earlier urged Puigdemont against making a decision that would make "dialogue impossible". On Monday, Ada Colau, the popular mayor of Barcelona, warned that a unilateral declaration of independence would put "social cohesion" at risk. Puigdemont's regional government allies, the far-left CUP, lamented a missed opportunity for independence. "We believed that today was the day to solemnly declare a Catalan republic, and we probably missed an opportunity," said party lawmaker Anna Gabriel. The crisis has also caused deep uncertainty for businesses in one of the wealthiest regions in the eurozone's fourth largest economy. "The companies have left, the banks are gone, we are all going to see what will happen," said Barcelona resident Bertran. Publishing house Planeta was the latest to announce a move to Madrid after Puigdemont's speech.